Do you know youth who love Hip Hop Music? Do you work with high-school age youth who love to express themselves through writing and performing Spoken Word? Safe Harbour Putnam County is proud to present Messages, Music and Mirrors. Developed by hip hop artist Mikal Amin, Mirrors is designed to introduce youth to storytelling, reflection, and revision through Spoken Word and Hip Hop. Mirrors asks the questions: What do we see when we hold up the mirror to ourselves? To others? To the world? What is our truth and how do we express it? The goal of the program is two-fold: to use spoken word/hip hop as a tool to educate youth on processing emotions and developing resiliency, and to engage youth in a safe environment where they can develop creative writing skills and explore ideas through song, poetry, and rhyme. Mirrors is presented as four two-hour sessions covering the history of hip-hop, writing and performance (flow, cadence, content, presence and rhythm) and more. The final session of the program will feature performances by students. Messages, Music and Mirrors will be held on Saturday, December 8, December 15, January 5, and January 12th at the Training and Operations Center (TOPS) Center at 112 Old Route 6, Carmel (the back of the DSS CAMPUS) from 12-2pm. Class is limited to 20 students, and participants must be high-school age. The class is free but we ask that youth attend all four sessions. 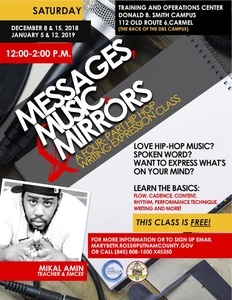 Mikal Amin, the creator of Messages, Music and Mirrors is an interdisciplinary hip-hop artist and educator. He is a veteran of nine international music and educator tours including extensive work as a State Department Cultural Ambassador through the American Music Abroad program, and as the Artistic Director for the Harlem Biennale “Our Better Angels” project. The Brooklyn resident has implemented master classes, cultural workshops, lectured and performed in over eight countries on four continents including Nepal, Zimbabwe, Mozambique, Brazil, France and at such institutions and festivals as Arca Theater (Czech Republic), Columbia, Fordham, Alliance France, Palais De Tokyo (France), Shoko International Festival (Zimbabwe), Hip Hop Kemp (Germany), Azgo Festival (Mozambique), The Bushfire Festival (Swaziland) and The Louvre. The founder of Fresh Roots Music, and co-founder of Re:Education and Say Word Entertainment, he currently serves as program manager for the Brooklyn Academy Music, and arts facilitator for the Cyphers for Justice at IUME, Teacher's College.